Many of California's finest custom bicycle frame builders will converge on San Diego April 3-5, 2009 for the 2009 San Diego Custom Bicycle Show. The event, which will take place at San Diego's Town and Country Hotel and Convention Center, will highlight the amazing skill level of California's custom bike frame builders, both full-time professionals and part-time hobbyists. Admission is $10 per day (or $18 for the entire three days), and for frame builders, a 10' x 10' booth space can be secured for only $450. The price for a bicycle trade booth will be slightly higher. In addition to the expo, the event will include seminars for custom frame builders on advanced craftsmanship and design, a get-acquainted dinner party on Friday night, and an after-hours get-together at the workshop of world-renown frame painter Joe Bell. "California is home to some of the finest custom frame builders in the world," says Brian Baylis, a custom frame builder himself and the Publicity Chairman of the non-profit San Diego Custom Bicycle Show, Inc. "The show will be an opportunity for frame builders to learn more about their craft and also a chance for consumers to meet the frame builders and even order a custom made frame." The three-day show schedule reserves Friday, April 3rd for frame builders only with seminars, booth set-up and dinner. On Saturday and Sunday, April 4-5, the show will open to general public. 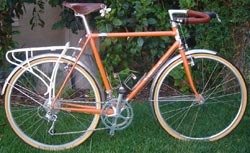 The San Diego Custom Bicycle Show is a bi-annual event and will rotate with a custom frame builder's show in Northern California in 2010. For more details on the 2009 San Diego Custom Bicycle Show got to www.SanDiegoCustomBicycleShow.com.